If someone were to conjure a word cloud describing how Red Hat sums up future plans for Ansible, which it just purchased for as much as $150 million according to some reports, the phrase “no change” would dominate. On Thursday, Joe Fitzgerald, who is Red Hat’s vice president of management, and Todd Barr, Ansible’s senior vice president for sales and marketing, hosted a webcast to explain what the acquisition means for both Red Hat and Ansible users. The take-away? Red Hat seems intent on maintaining Ansible’s success, while folding Ansible’s IT automation offerings into its own integrated open source packages for the enterprise. The way Ansible goes to market. It will continue to be developed and grow as a separate entity, though it will be heavily integrated into Red Hat’s portfolio. Ansible’s timeline for release of version 2.0 of its namesake software, and for the new version of Tower, the enterprise edition. Ansible’s strategy in supporting all clouds and platforms. It supports SSH on Linux/Unix, and PowerShell on Windows, eliminating the need to put agents on individual servers no matter the O/S. Red Hat’s support for Puppet, Salt and other Ansible rivals. Red Hat’s support for making all its software open source, which will include Tower. Most of Ansible’s software is already open source, anyway. Support for Ansible’s open source community. Red Hat plans to integrate Ansible into an end-to-end hybrid cloud management suite, allowing customers to provision new nodes using Red Hat’s Satellite lifecycle management software, as well as use it with Red Hat’s Cloudforms platform, which provides orchestration, governance, and policy-based controls across hybrid clouds. Red Hat found Tower attractive, Fitzgerald said, in no small part because the software is simple to use, and modular. It could help remove barriers in setting up hybrid cloud computing systems, particularly those based on OpenStack (No word on if Ansible will continue its existing partnerships with Cisco, CSC, Hewlett-Packard, and Rackspace to make deploying and managing OpenStack simpler). Ansible is also popular as an open source project, having attracted over 1,200 contributors on GitHub. It has even started to pull market share from Puppet and Chef. Ansible Tower provides the user-interface to centrally execute and monitor Ansible playbooks. There are more than 400 playbooks for using Ansible across a complex enterprise IT environment, providing access control, credentials management, delegation of jobs, compliance, and other features. “The bottom line is that Red Hat supports other people’s stuff. It’s all about providing choice,” Fitzgerald said, perhaps trying to add some distance from the hullabaloo that ensued last year after an internal memo suggested that the company wouldn’t support rival OpenStack implementations. Barr said Ansible, a company created two years ago with a roster of Red Hat alums, will continue to expand its footprint across clouds and platforms and it is hiring to quickly scale out its team. It is previously reported the company had doubled headcount to 50 since the beginning of the year, and will grow to about 85 by year’s end. And Fitzgerald said Red Hat plans to quickly scale out training on Ansible. Global Learning Services at Red Hat previously reported that demand for OpenStack skills had doubled since last year and were out-trending Linux certifications. In May, the company announced plans to integrate three existing products into Red Hat Cloud Suite for Applications to improve development and deployment of applications at scale. The purchase strengthens Red Hat’s position as a DevOps provider, supporting other technologies key to Red Hat’s strategy, including OpenStack and containers, Jay Lyman, cloud platforms research manager, for 451 Research, told The New Stack. “The fact that Ansible backs its open-source software with commercial enterprise support makes the company a good match for Red Hat, both technically and culturally,” he wrote in a report on the acquisition. Gartner has predicted the market for DevOps tools will reach $2.3 billion this year, an increase of 21.1 percent, from $1.9 billion in 2014. The deal may make Chef, Puppet Labs and SaltStack more attractive acquisition targets to potential acquirers, Lyman added in his report. And these rivals might be more expensive buys: Chef has raised $137 million and Puppet Labs $85.5 million, compared to just $6 million raised by Ansible. Ansible with its Red Hat heritage made an attractive acquisition target, and it didn’t hurt that its Durham, N.C., home is mere miles from Red Hat’s headquarters in the Raleigh suburb of Cary. Cisco, HP and Red Hat are sponsors of The New Stack. 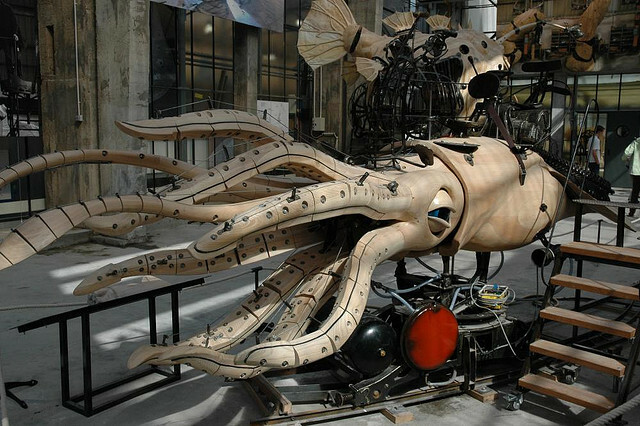 “Galerie des machines: le calmar géant à rétropropulsion” by Claude Joannis, licensed under the Creative Commons Attribution-Share Alike 2.0 Generic.